Nancy Shumway Adams from West Simsbury, Conn. took a photo of the stone of Samuel Wardwell, an alleged witch, who was hanged on Sept. 22, 1692. Adams is a 10th-generation descendant of Wardwell. "I didn&apos;t even know there was a witch in the family," she said. SALEM — In 1692, when children often died young, Rebecca Nurse’s lived. During the Salem witch trials, this was one of the reasons locals were convinced that Nurse was a witch, according to Benita Towle, her granddaughter nine generations removed. “I was told that people were jealous of her,” said Towle, a Milford, Conn., resident. 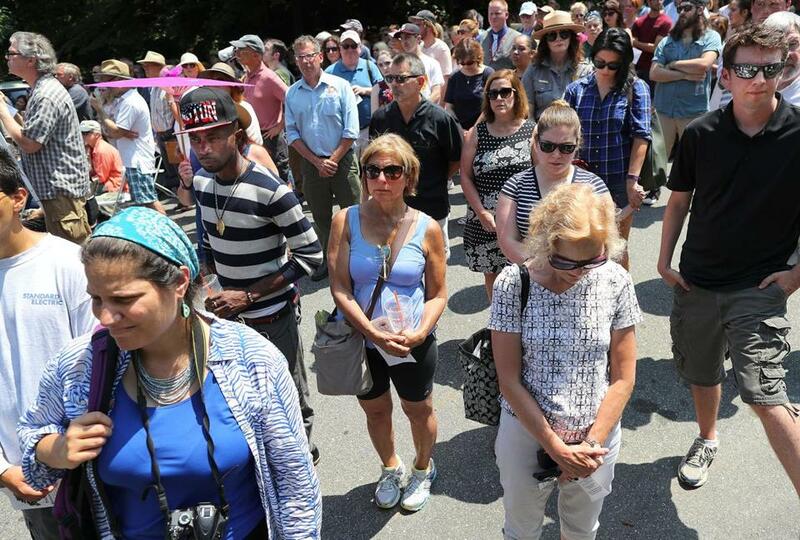 Exactly 325 years since Nurse’s execution, dozens of people gathered at the spot of her death Wednesday for a dedication of the new Salem Witch Trials Memorial at Proctor’s Ledge, where 19 were executed because of accusations of witchcraft. Wednesday’s event began at noon, around the same time the first of three mass executions took place on the site on July 19, 1692, when five women accused of witchcraft were hanged: Nurse, Sarah Good, Elizabeth Howe, Susannah Martin, and Sarah Wildes. In addition to those executed at Proctor’s Ledge, at least five died in jail, and one was crushed to death. “We should not be here today,” the Rev. Jeffrey Barz-Snell said to open the event, adding that these deaths should have never been a part of Salem’s history. 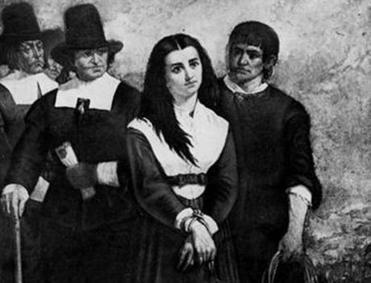 A group of researchers said they found the location in Salem where 19 people accused of witchcraft were hanged in 1692. Barz-Snell, the pastor and teacher of the First Church in Salem, told the audience that Nurse was a member of his congregation before she was sentenced to the gallows. Among those in attendance were Salem Mayor Kimberley Driscoll and professor Emerson Baker of Salem State University, one of the researchers who, in 2016, confirmed Proctor’s Ledge as the location of the hangings through eyewitness accounts, historic document analysis, and mapping technology. 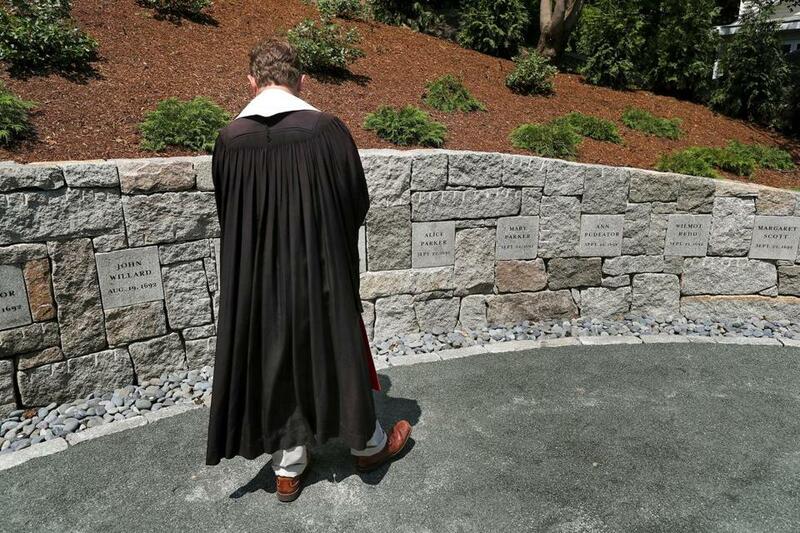 In her address, Driscoll acknowledged that the memorial — a semicircle of stone with the names of the victims — is a reminder of all those who lost their lives to fear, malevolence, and superstition during the witch trials. Driscoll thanked those involved with making the memorial a reality, along with residents in the area, and those in attendance to honor the memories of those whose names are engraved. The memorial was primarily funded through a $174,000 Community Preservation Act grant, along with small donations, many from descendants of those executed at the site, according to a statement. The design was developed by Martha Lyon, a landscape architect, and included a landscaped slope down from where the executions are believed to have happened. At their core, the Salem witch trials were examples of the tragedy that can come from people pitting themselves against one another, Salem City Councilor David Eppley said. “The only way I know that Salem and its political leaders can atone for such heinous acts is to continue to serve as a story of warning for the rest of the nation, and this world, on what could ultimately happen when you turn your neighbor into the ‘other,’ ” Eppley said. The Rev. 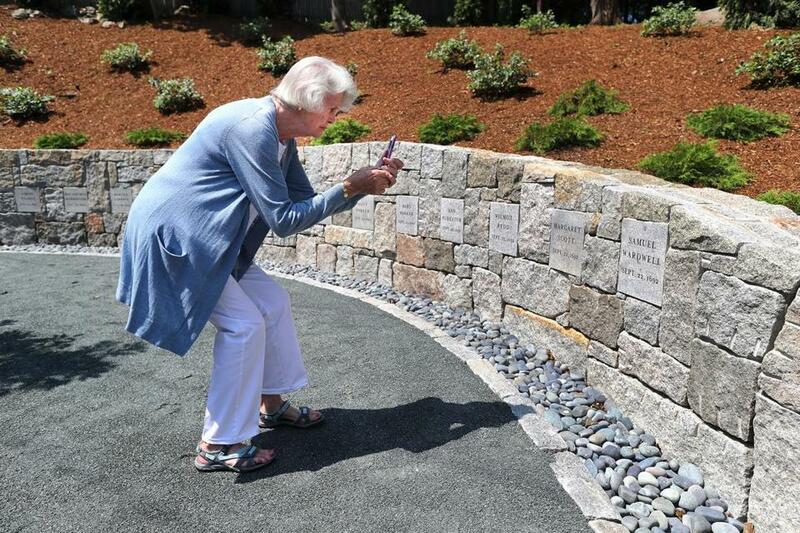 Jeffrey Barz-Snell looked at the witches’ names on the wall before the dedication of the new Proctor's Ledge Memorial. People paused during a prayer at the end of the service. 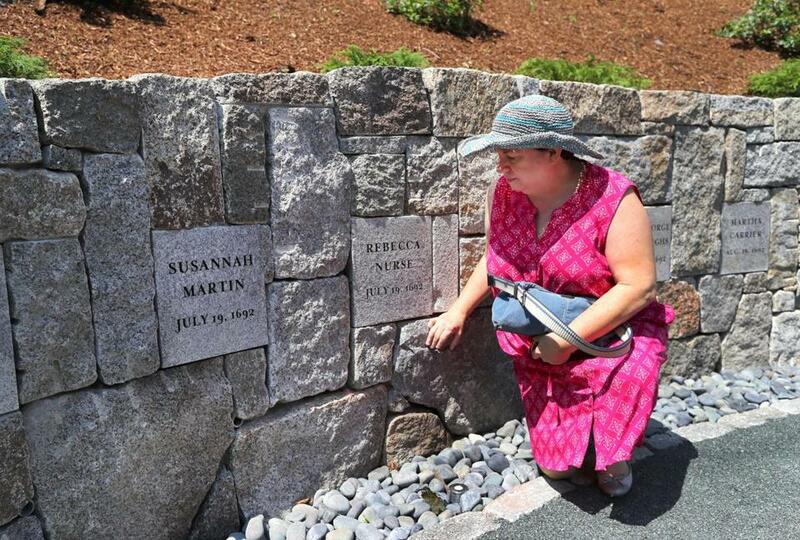 Benita Towle from Milford, Conn., stooped to touch the stone of executed witch, Rebecca Nurse, who was hanged on July 19, 1692. Towle is the seventh great-granddaughter of Nurse. Kiana Cole can be reached at kiana.cole@globe.com. Follow her on Twitter at @kianamcole.